WITH or without an 'e', good whisky is made all over the world today, writes Rupert Patrick at WhiskyInvestDirect. But for strong branding and global sales, it really pays to have the head-start which Scotch whisky enjoys. The reputation of Japanese whisky, for instance, is growing internationally. But still 98% of it is consumed in Japan. A paltry 8,000 cases were sold in the UK in 2014. Indian whisky tops the world table in terms of total sales, shifting around 184 million cases. But 97% of it is drunk in India, and who in Europe has heard of Officer's Choice or MacDowell's, two leading brands both selling over 20m cases per year? Indeed, of the world's top 20 best-selling whisky (or whiskey) brands, eleven are Indian. But it's only the three Scotch brands, two American brands and one Irish that have any meaningful international reach. Even the Canadian leader, Crown Royal with total sales of over 5m cases, only has three export markets with sales above 50,000 cases. That's not enough to put it on the global whisky map. Canada and the US together export about 30% of their joint whisky production, but this is nothing compared to Scotland. It sells 93% of Scotch output in markets beyond the UK. So how hard is it to build a global whisky brand? Leaving aside Kentucky's highly successful Jack Daniels and Ireland's fast-growing Jameson's, let's look more closely at Scotch. The UK market leader, Famous Grouse – surely that must be a global brand? Wrong. Grouse's export sales have not advanced much in ten years, and with only two markets (US and Taiwan) selling over 100,000 cases according to the IWSR database, its domestic success has not been repeated anywhere. Perhaps the problem is in the name? Or has it been poor marketing? What appeals here in the UK isn't often a recipe for success elsewhere. Even when a brand is building export sales, and even if marketing seems to be hitting the sweet spot in a variety of countries, a major pitfall to watch out for can prove to be the quantity of stock. International Distillers & Vintners grew sales of its J&B blend from 3.3 million cases in 1985 to 6m in 1998. Then IDV merged with United Distillers – owners of Johnnie Walker – to form Diageo (LON:DGE). And since then, sales of J&B's once power-brand have fallen back to 3.6m cases. The problem? The new whisky giant didn't have enough stock to feed high growth in both the J&B and Johnnie Walker brands. Crucially, nor was it brave enough to lay down enough stock to plan for both succeeding either. While this cautious strategy worked well for Johnnie Walker, it sucked the life out of J&B. The former's sales, combined between Red and Black, were 10m cases in 2000 and have surged to 19m today. If forecasting and stock management is a problem for blended whisky brands, it's a much bigger headache when it comes to single malts. Indeed, some think that single malts should not even be considered 'brands' on account of the near impossibility of creating long-term quality consistency if demand outstrips supply. The Cardhu example is salutory for anyone trying to bend or push the rules to accommodate higher than planned growth. The No.1 single malt from Diageo at the start of the 2000s, and a key note in world No.1 whisky blend Johnnie Walker, this 12-year old Scotch was growing so fast in Spain and Portugal that it risked selling out worldwide. So Diageo scaled back supply to the single malt brand, and switched it for a blend of different malts instead, selling them in Cardhu bottles with Cardhu labels. Diageo then adopted (or "adapted") the term "pure malt" to describe the new product going by the old name. Competitors were outraged. A nasty industry kerfuffle ensued before Diageo decided to backtrack. The brand has since recovered half its peak annual sales, reaching the No.2 spot behind DGE's leading single malt, The Singleton. Diageo's strategy with this newer product may prove very astute. Many Scotch drinkers are shifting away from blends to single malts, especially in developed markets, and many of these products are recruiting new consumers at unprecedented rates. This means many distilleries just don't have enough mature whisky to go round, so sales of their single malts, and sometimes their blends, are being stunted. The Singelton gets round this age-old problem by being a 'brand' rather than the name of a distillery. It's a single malt, but not from a dedicated distillery. Instead, it uses single malt from a list of three, and that may grow soon. 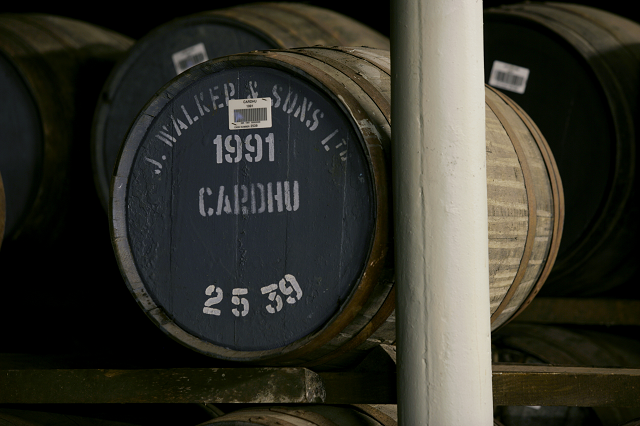 Stock management is of course a lot easier if you don't have to age your whisky. Many Indian whiskies are made from molasses alcohol, not grain, and are not aged for a day never mind the three-year minimum for Scotch. So they can grow as fast as the orders come in. And in India that's pretty fast. But rather than worry about the current boom in local Indian whisky, the Scotch trade should concern itself with laying down enough stock for the very same Indian consumers who now aspire to drink Scotch today and will almost certainly do so in five, ten and twenty years' time. Because in branding, as in the Scotch whisky business itself, the best time to lay down stocks is ten years ago. The next best time is today.